Galina Alexeyevna Kulakova (Russian: Галина Алексеевна Кулакова, born 29 April 1942) is a Soviet former cross country skier, arguably the best skier on distances shorter than 10 km in the early 1970s. She won four Olympic golds, two individual in 1972 and two relay golds in 1972 and 1976. She was the most successful athlete at the 1972 Winter Olympics, along with Ard Schenk of the Netherlands. Competing in the World Championships, she won three individual golds, two in 1974 and one in 1970, and also two relay golds in those years. 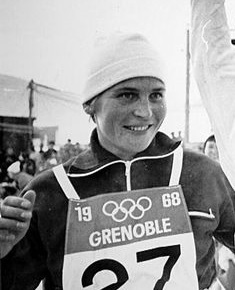 Kulakova also won the 10 km event at the Holmenkollen ski festival in 1970 and 1979. Galina Kulakova was also 39 times Champion of the USSR between 1969 and 1981. For her achievements she was awarded Order of Lenin and Badge of Honor. She was also awarded the silver Olympic Order in 1984 by the International Olympic Committee President Juan Antonio Samaranch. Galina Kulakova ended her sports career in 1982. At the 1976 Winter Olympics in Innsbruck, Kulakova finished third in the 5 km event, but was disqualified due to a positive test for banned substance ephedrine. She claimed that this was a result of using the nasal spray that contained the substance. Both the International Ski Federation and the International Olympic Committee allowed her to compete in the 10 km and the 4 × 5 km relay. Note: 1 Until the 1999 World Championships, World Championship races were included in the World Cup scoring system. ^ a b Evans, Hilary; Gjerde, Arild; Heijmans, Jeroen; Mallon, Bill. "Galina Kulakova". Olympics at Sports-Reference.com. Sports Reference LLC. Archived from the original on 20 January 2011. ^ "Athlete : KULAKOVA Galina". FIS-Ski. International Ski Federation. Retrieved 5 April 2018. This page was last edited on 11 January 2019, at 16:30 (UTC).